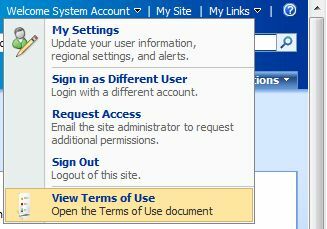 Title="Add Links to user section"
Description="Feature that adds a link to Welcome User section"
SharePoint Password Change contains two Web Parts: SharePoint Password Change Web Part and SharePoint Password Expire Warning Web Part. You can change your own password on Password Change page or Password Change Web Part. To enter Password Change page, you can click the “Change password” link on SharePoint Welcome menu. You can also change password by adding SharePoint change password Web Part on a page. When you enter this page, Password Change Web Part will automatically detect your domain and name. After you have set your password, Password Change Web Part will verify the new password and save the change. If current password is incorrect or does not meet password policy, you will receive a piece of error message. Password Expire Warning Web Part can notify users to change password and provide users a URL to go to the password change page. You can configure the URL and decide how many days before expiration date should it notify users. When you have access to the page on which Password Expire Warning Web Part is configured, the Web Part will automatically identify your domain, user name and user account expiration date. If your password expires, the notification and URL will display. To define a custom action for a particular menu, you must identify the menu by setting the location to the appropriate Windows SharePoint Services namespace, and by using the ID that Windows SharePoint Services uses to identify the specific location. For example, to add a custom action to the Site Settings page, set the Location attribute of the CustomAction element toMicrosoft.SharePoint.SiteSettings.and specify a particular area within the page through the GroupId attribute. Different actions may require using different CustomAction attributes to identify the menu in which to place a custom menu item. But you may also need to specify other parameters for the action, for example, to specify a version, user permissions required to perform the action, or placement in relation to existing actions in the menu. The custom actions of the following example show a variety of attributes. See Default Custom Action Locations and IDs for a list of the default custom action IDs and locations that are used in an installation of Windows SharePoint Services. This article covers how to hide (remove) the View All Site Content link and/or the Recycle Bin link from the quick launch navigation without having to customize the master page. Additionally, I cover how I accomplished along with other options, all using the standard functionality provided in Windows SharePoint Services 3.0. Important: This solution is not an answer for security. The user will still have access to the View All Site Content page. The View All Site Content link is simply removed or hidden from the page. There is no license required to use the Hide View All Site Content feature. This is available to the public (business or personal) for free. There is no implied or explicit warranty. For those interested in how to install this solution, it is very easy and does not require any coding, compiling, or editing. Note: This command must be executed on the (only one) SharePoint web server, and you must be a local administrator. Navigate to the site you want to hide the View All Site Content link. Go to the Site Settings for that site (Site Actions > Site Settings). Click the Site Features (not the Site Collection Features) link under the Site Administration section. Activate the new feature named “Hide the View All Site Content link”. Your View All Site Content link should now be hidden and the View All Site Content link should now appear in the Site Actions menu. For those only interested in using this solution, you do not need to read any further. However, for those who are interested in how this is accomplished, the rest of this article discusses just that.